An excellent present for a friend or relation who appreciates quality craftsmanship but who would like to be able to choose their own gift. The gift token can be obtained at any OCG exhibition or by contacting admin@ocg.co.uk Chose how much you would like to spend starting at £5.00 and rising in £5.00 increments. 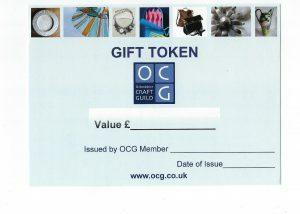 OCG gift tokens can be redeemed at any exhibition organized by the Guild or directly through any Guild member participating in this scheme. Tokens can be redeemed towards any purchases, but no change can be given.